aytm Fortune Offer is also a new free paytm cash offer with products. Offers introduces earlier like paytm bourbon offer, paytm garnier offer, paytm yipee offer, paytm set wet offer, paytm godrej offer had got huge success. In these Paytm cashback offers one have to buy the product and find the paytm cashcode inscribed in it. Find the Cash code and then apply it on paytm fortune offer link. When you apply this you get Free Paytm Cash worth Rs.100 or Rs.30 with the same. One can use all of the paytm cashback offers and earn free paytm cash. You can use your paytm cash also with the paytm coupons to get extra cashback also.Get Rs 30 free Paytm cash code on Purchase of 1 Litre Fortune pack and Rs 100 free Paytm cash coupon on Purchase of 5 Litre of Fortune pack.One users can avail the offer for two times one for 1 litre pack and other for 5 litre pack.So don’t wait get free paytm cash with Fortune Paytm Cashback Offer.Only buy that fortune pack which have label regarding paytm offer. Important Note : While redeeming the cash codes only use Chrome browser if you are mobile users.PC/laptop users can use any browser. If you buy 5 litre pack scratch code will be on the jar. 3. To get your free paytm cash code you need to scratch the code with the help of coin etc. 6. 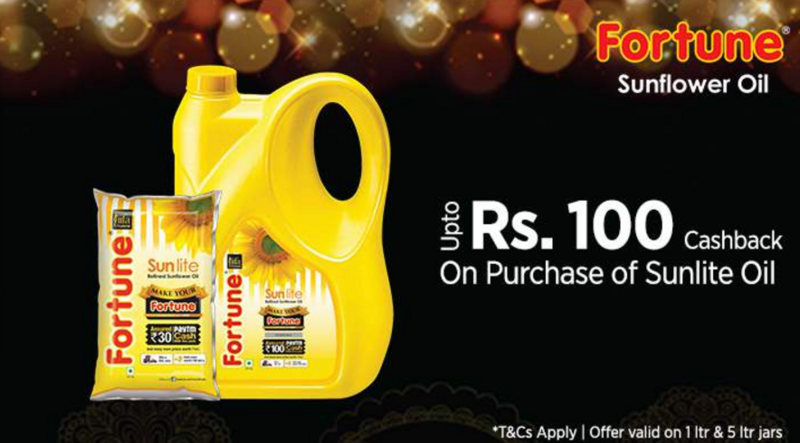 Enter Paytm Free Cash code which you got from Fortune Sunflower oil Pack. 7. Login or Sign up for new Paytm account. 1. Paytm Fortune Offer Valid till 15 March 2016. 3. Each code is unique and can be used once. 4 Responses to "Paytm Fortune Offer – Free Paytm Cash up to Rs 100 [South India only]"
sir i take retailership from rechargekarle.com.then i add rs 20000 there.but from 10 december 2015 this site is not working. there is not any contact information.there is near about 17000 in my rwallet.please tell me what i do now.